Your windows form an important part of your home’s historic character. They are one of the few building elements that affect both the interior and exterior of your home. That’s why homeowners want to preserve their windows appearance as much as possible. Renewal by Andersen® of St. Louis answers some questions about whether or not you need to repair or replace your window. When do I need to replace my window? As an expert in home remodeling in St. Louis, MO, we recommend replacing your windows once there are missing components or signs of extensive deterioration. Excessive and irreversible window damage means that your home is more vulnerable to the weather. It also causes energy leaks, drafts, and uneven room temperature. We can solve this by installing beautiful replacement windows that can match your older windows’ style. Our decorative options and custom grille patterns can meet your home’s needs. 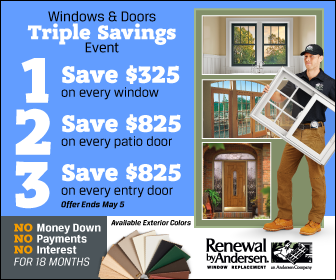 What are the benefits of Renewal by Andersen windows? Our replacement windows in St. Louis can provide your home with many benefits. All of our windows come st andard with High-Performance™ Low-E4® glass that can save you up to 25% in your energy bills. This glass also protects your interior from UV rays and can make your home more comfortable. We also manufacture our window frames from our exclusive Fibrex® material. Fibrex frames won’t crack, peel, blister, corrode, or chip. They are low maintenance, long-lasting, durable, and strong. What do I need to remember when getting a replacement window? As a specialist in windows and doors in St. Louis, we recommend maintaining your new windows’ placement in relation to the wall. This preserves your current windows’ three-dimensional appearance. You also need to match the overall complexity, shape, and size of your windows and window parts. Your goal is to match your new windows with your current units as closely as possible. During our initial consultation, our window expert will help you achieve this goal. Your home is a living record of a specific time, culture, and place. Renewal by Andersen windows can preserve your home’s historic character while allowing you to enjoy the benefits of advanced window technology. Our windows can save you money, improve your home’s comfort, and provide protection from the weather. Call us at (314) 332-2364 to learn more about our replacement windows. You can also schedule a free in-home consultation.